I’m hardly an expert on these things, but I think it would be helpful – if nothing else than for switching up the long run routine. Keeping things interesting. Very wise to make a pact with yourself–plus your readers!–to use Bronx only as a training run. I’ve been guilty of blowing goal races by running all out in what should really have been pacing exercises. Seems like any kind of competitive streak can go haywire once you pin on a number and get into the pack. Other ways of reining oneself in are pacing someone who’s a bit slower or teaming up with someone and agreeing beforehand that you’ll celebrate success ONLY if you hit, or come very close to, your target pace. Have a great (controlled!) run! Just tell yourself it is a “long run with a lot of friends” hahaha. I race most of the club points races so, yep, I do race, but I may not “race” all of them depending on how close it is to the marathon. For example, for the Scotland run this year, I did 10 miles before it and then ended it with that 10K for 16 miles total and was definitely not running those last 6 miles at 10K pace! I also am amazed at what running buddies do for my running to! If left to my own devices I would be either a) killing myself by starting out too fast or b) leisurely jogging all the time! I have leftover cream cheese from a dessert I made a few weeks ago. I ended up making a spread with it by adding honey and walnuts. Yeah- best thing on toast EVER. I know how hard it is to run races at NOT a race pace. When you sign up, you think … oh, this is no problem, it fits in perfectly with my training schedule, and it’s the perfect length! It’ll be so much fun to run with a giant group of people while exploring a new area. Except then you toe the line and the adrenaline is pumping and everyone around you is peeling away. You wearing the Sweat Squad uniform = made my day yesterday. The Bronx Half should be awesome! I heard it’s flat and fast! Good luck! haha, don’t tell me it’s flat and fast!! Interesting take on racing! I did a bunch of races last year mainly so that I’d get guaranteed entry to run the marathon again this year. I’ve had plenty of time to compare this year’s training to last year’s and I was honestly such a rookie! No Garmin back then, so I didn’t really focus on pace at all (or stretching…or fueling properly…oops). I’m naturally inclined to run slightly faster in race situations, so in the end, I think my races (the 18-mile Tune-Up, Grete’s Half and the 5-mile Kickoff) helped me run the marathon faster than I believed I could. I’m doing a half here in Houston two weeks before NYC (eek, hope that’s not too much too close to Race Day) and then a 10K the Sunday before NYC (same day as the NYRR Kickoff 🙂 ). I register for races because I like to race. It helps my speed and pacing by tracking other runners. I also have really bizarre racing habits, so maybe don’t listen to me. I have cut back on races this year to focus more on training. See you at NYCM. You probably just had a bad day on Tues (evidenced by your awesome run on Wed), I wouldn’t hold too much stock in it. I like to incorporate a half marathon as a tune-up race later on in marathon training but if it doesn’t work out, I’m OK with that. 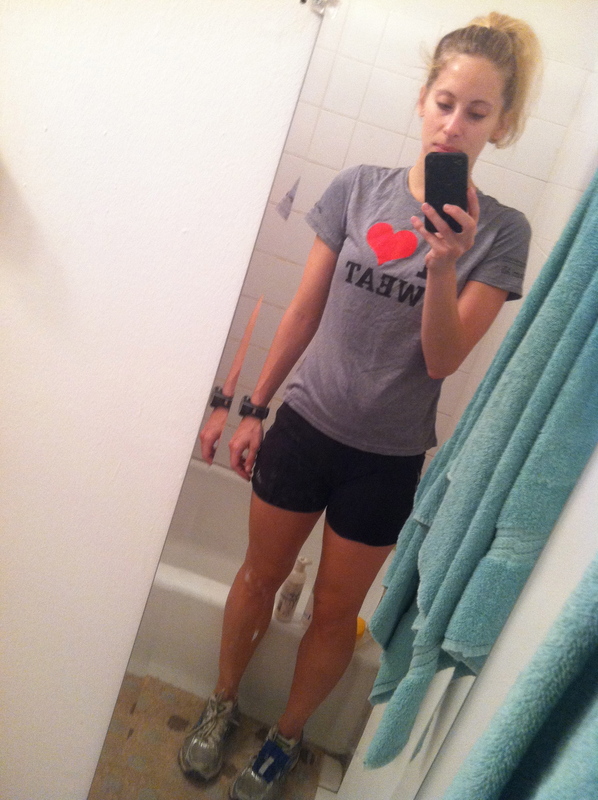 I’ve been having a bad running week too and it’s funny because I’ve heard that from a lot of other people. What’s going on here! Is it the rain!? Ah! Yes – I have the same problem with forcing myself to NOT race during road races (unless it’s the goal race). Just stay focused on the point of the run and have fun with it. You should run (not race!) the philly 1/2 next month! 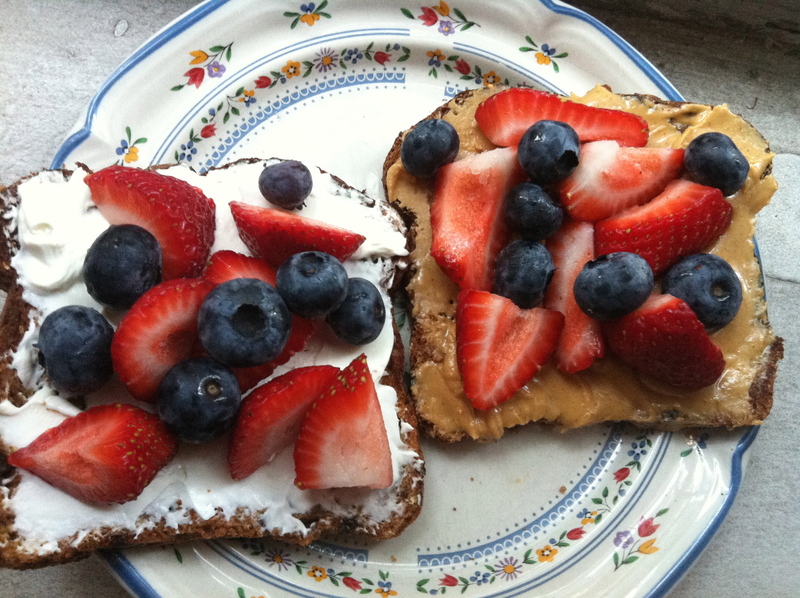 Ooh, and you should try toast with cream cheese and also add some jelly on top – so good. But that fruit actually looks better. Glad you’re out of your rut! I never really “raced” much until I moved to NYC and the options are limitless! I have a really hard time showing up for a race and not attempting to race it/run fast, even if I’m technically not trained for it. (Cough cough, Manhattan Half, cough cough Queens Half.) At the Queens Half, I tried to tell myself just to take it easy as a supported long run (especially since it was hot! ), but I get wayyy too caught up in the “race” atmosphere and all the people around and I can’t wait to run fast! I think it can be helpful to do a race (or at least part of it?) at marathon pace, which is more or less what my half turned out to be. Gives you the idea of running fast while taking water and definitely much different than just doing loops of CP! I am admittedly not the best at this, despite the fact that I keep signing up for “training” races. I just have a hard time not trying my best on race day, especially if I show up and feel really good! Even still, I love doing them. It can be a fun way to get in the miles and it’s really nice to have the support along the way. Plus, I think they can be a great way to practice your marathon pace – that’s what I usually end up using them for. Sounds like you had a good run and that you know what you need to do in the Bronx and you’ll stick to it. I like doing races while I’m training, even if I’m not “racing” it, simply because they’re fun and it’s great to enjoy the race atmosphere! As for races during training – I like to do them. I find it gives me an extra adrenaline rush to push me through to the end especially through marathon training. LOVE that shirt!! Seemed like a good run to me 🙂 Happy Almost Weekend!! I tend to do a couple races during each training cycle, and if it’s a 10k I might race it, but if it’s a half marathon or a 20 miler, more likely I am using it as a training run, or want to practice running at marathon pace. I’ve learned to be honest with myself about my expectations. If I want to race it, I can race it (as long as that’s smart given my mileage for the week), or if I want to see if I ran run it at a certain pace I’ll go for that.